From flavor to nutritional benefits, there are a ton of reasons why once an individual buys local at a farmers market they never go back to “grocery store produce” again! But not everyone realizes the significant environmental benefits of farmers markets. Which is why, in part, the National Farmers Market Coalition is celebrating National Farmers Market Week this August 5-11. 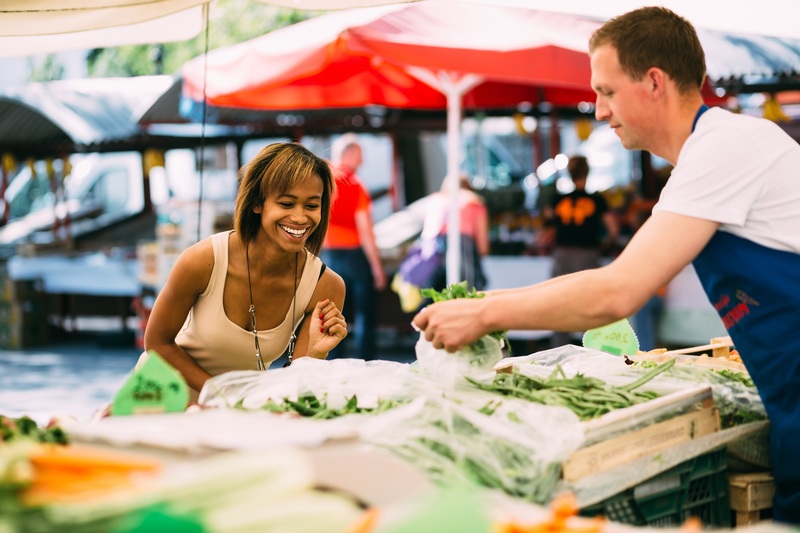 60 percent of farmers market shoppers say they get better prices there than the grocery store. Farmers markets make fresh food more accessible to underserved, low-income areas and increase revenue for local farmers! Farmers who sell locally return more than three times as much of their sales to the local economy. Growers selling locally create 13 full-time jobs for every $1 million in revenue, while those selling non-locally create one job per $1 million. Local farm sales preserve rural livelihood and farmland—which currently in the U.S. is being lost to development at the rate of one acre per minute. One out of every four farmers selling locally grow on land that is protected from commercial development. Farmers markets reduce the carbon footprint! Locally or regionally grown food travels approximately 27 times less that food sourced for “supermarket” distribution. Less travel equals less fuel consumption, less water consumption, less pollution released into the environment. Farmers market goods are hands-down more environmentally friendly. Farmers market producers use far more chemical- and pesticide-free products, which in turn mean less water and soil contamination due to run-offs. In a way farmers markets are like some of the “superfoods” you’ll surely find there! That is, they are packed with benefits for the body, economy and the environment. So, give it a try during National Farmers Market week, and keep up the practice – it’s one of the easiest ways everyone can contribute to a more sustainable planet.